I see you, dog-tired, with your grey looking skin, feeling down, in your unicorn slippers (unicorn sleepers, really ? ok, no judgment here). It’s time to take care of you, to eat vitamins with a nice little dish house made in 15 min, because winter vegetables have arrived and it’s time to enjoy them! They are nutritionally interesting, you know. There are also some associations that are welcome, such as mixing iron-containing foods with vitamin C-rich vegetables because it helps iron absorption. This is what we are going to do here, attention, however, this technical prowess will give you Usain Bolt’s energy before a race! Endive is excellent for the intestines, good for digestion, it is rich in anti-oxidants, vitamin C and contains vitamin B9. This is the time to enjoy these good winter vegetables that are so nutritionally useful! Red beans are rich in iron of excellent quality. Rich in protein, they also contain magnesium, potassium, calcium, vitamin B9, phosphorus and fiber. Red beans are a panacea in a vegetarian or a vegan diet. As long as they are not overcooked. Rich in antioxidants (polyphenols, flavonoids, limonoids), lemon is an excellent source of vitamin C and minerals (potassium, calcium, magnesium, phosphorus). One of your best ally for winter. The day before (or 6 hours before at least), soak the red beans into a large bowl of water. Put the beans soaked for several hours in a steam cooker. Cook them for 5 to 10 minutes depending on the chosen device, paying attention to the fact that the beans have to remain crispy or “al dente”. Indeed, when they are overcooked and “soft”, the beans reject phytates which make them indigestible and, incidentally turn yourself into a flatulist performer (And unicorn slippers and farts, it starts to be a little too much, even if you are married, ed). Set aside (I mean the beans, not yourself). Arrange the endives cut in half lengthwise in the steamer, cook them for 5 to 7 min depending on the device used and set aside. They must be cooked but not soft (yes, we do not like the soft stuff here, you’ll have to deal with it. Al dente please, the endives). In a hot oiled wok, put the endives on their inner side and brown them for one to two minutes without turning them over (brown only the inner side). set aside. 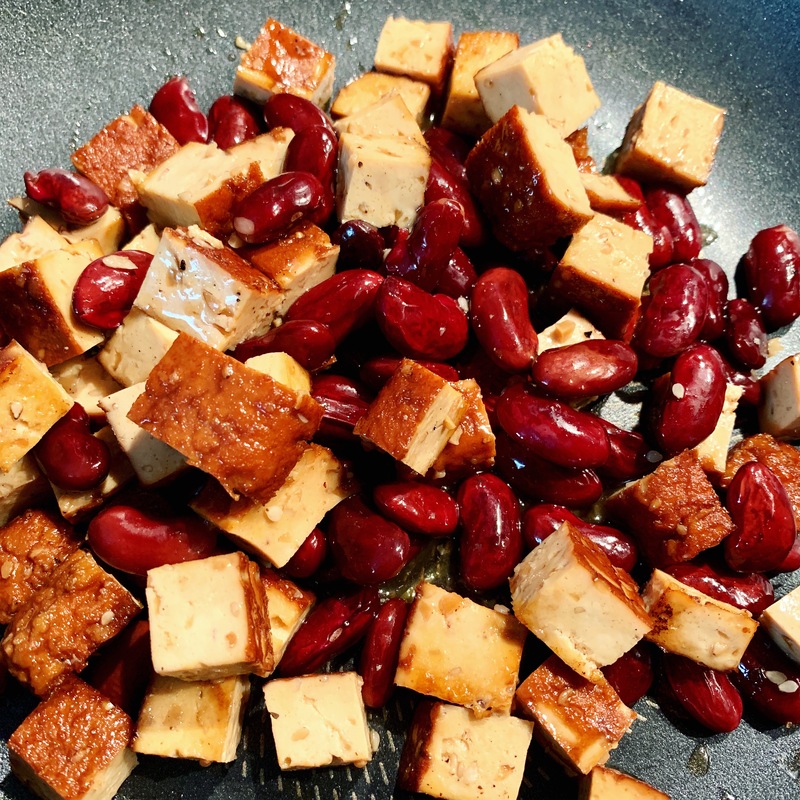 In the same wok, brown the tofu previously diced for 2 to 3 minutes over medium-high heat, add the red beans and deglaze with the teriyaki sauce and water. Taste, salt and pepper to taste and reduce the sauce until it thickens a little (about 2 minutes) and then cut the fire. 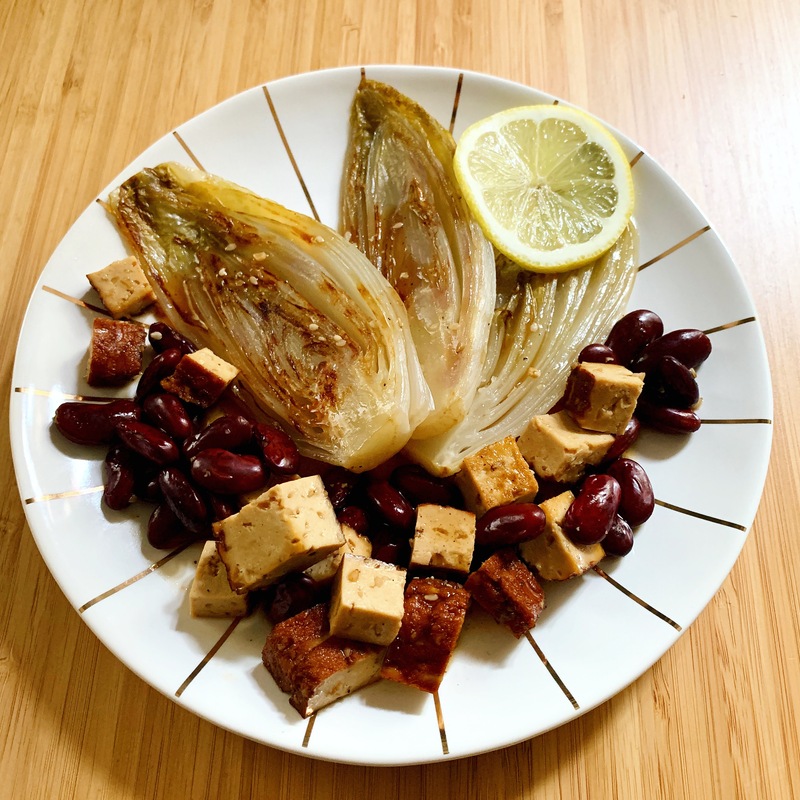 In your most beautiful plate, arrange 2 endives per person, then add the tofu / beans / teriyaki mixture with love art and beauty (we aren’t at Mac Donald’s here, ed). End with a nice generous line of lemon juice on each endive, and why not, a thin slice of lemon for decoration. Enjoy your meal! 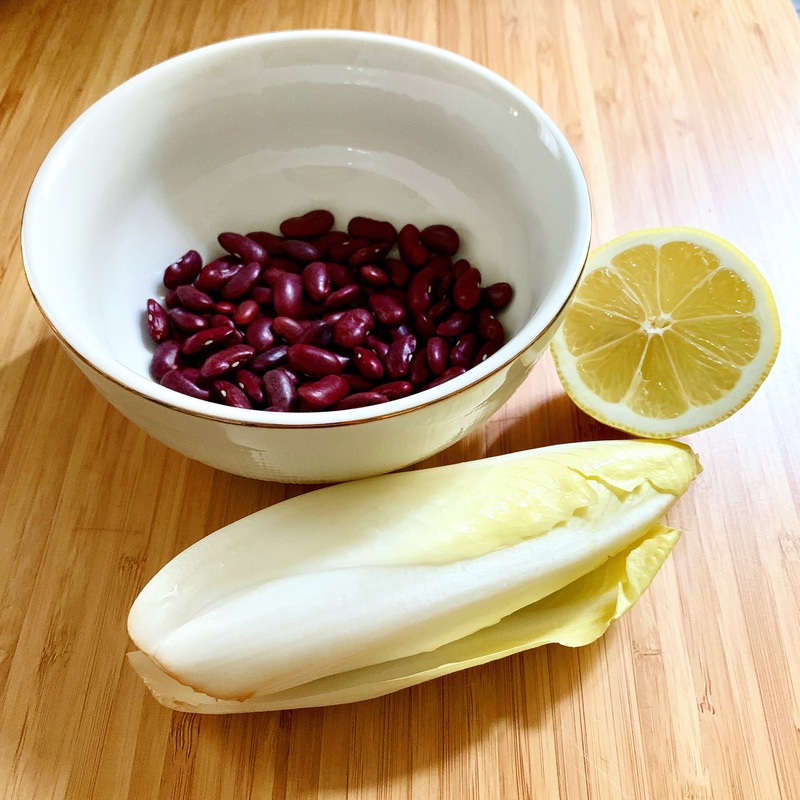 In this recipe, vitamin C contained in lemon and endive will help the absorption of iron (red beans and tofu), for a “boom boom” effect that will make you find back the energy of your 20’s in two bites, or run a race as quick as Usain Bolt, as we said. It took you 15 minutes to take care of your shape and your taste buds. This recipe does not sound like much, but I promise you that the last time I did it I almost got kidnapped as much as I was asked for more. So anytime you make this recipe, always plan some more endives and a little more beans, you never know, it could save your life! Previous Post Overweight and its mysteries … or not. Next Post In winter, offer cauliflowers !